Many websites devoted to spinal health are sponsored by large, for-profit corporations. 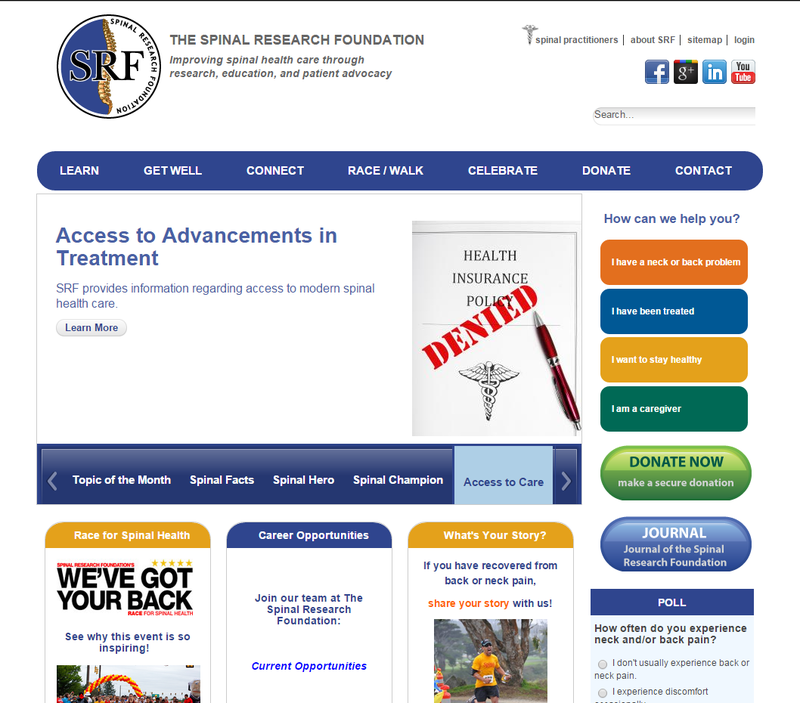 SRF is a nonprofit organization dedicated to providing a nonbiased look into this important health topic. They wanted a way to build a community that can learn about spinal health from many dimensions, can share stories and successes, and can promote their nationwide We’ve Got Your Back races and fun runs. The existing website did not garner much traffic because it was too difficult to keep content relevant and updated. A content review unveiled tremendous gaps in content, such as conditions and treatments. The site also needed to provide relevant information to each audience type seeking support, and a way for the audience to feel connected with the cause. Our analysis determined that Drupal would be a good platform for building the main website, while also supporting the requirement for the staff to be able to create microsites for each race and fun run without any technical support. The architecture was designed with an active navigation model. Users can Learn, Get Well, Connect, Celebrate and Donate. This paradigm gives the user a sense of belonging to the organization. Four user types (personas) were defined, each with a landing page of resources available to get them started on the website. The site is integrated with Cause View to handle story submissions, volunteer opportunities and donations. A key component of the site aligns with the major fundraising effort of SRF, the We've Got Your Back races and fun runs. These races have grown from three in 2012 to eight in 2014. SRF can add races to the website without any technical support, and update them for yearly reuse. Each race can have it's own navigation, home page and interior pages, along with the necessary imagery and multimedia for race promotion. The site also hosts the biannual Journal, an Ask the Expert feature, videos and success stories, and champions volunteer and physician successes.